Newcomer Family Obituaries - Gerald Philip 'Jerry' Brown 1932 - 2018 - Newcomer Cremations, Funerals & Receptions. Jerry was born in Green Bay, Wisconsin, the eldest of the 5 children of Curtis and Esther (Layman) Brown. His four sisters came along in the next ten years: Harriet, Nancy, Margaret, and Ruby. He worked at many jobs, starting at age 11, in order to help the family out, but still found time to play ice hockey, do some fishing, and play hookie from church with his sister. At the age of 17, he left home to join the Air Force, which gave him a 20 year career in radio and communications, world-wide travel experience he treasured, and while stationed in Germany, he met his beloved wife, Helmi. Eventually, the Air Force brought them to Lowry Air Force Base, and he and Helmi decided to make their forever home in Aurora, Colorado. Jerry retired from the Air Force in 1969. The next adventure began just about 9 months later, when their son, Scotty, was born, just as Jerry was beginning his second career in aerospace quality. It was an exciting time with friends and their families bowling, golfing, fishing, skiing, and eventually scuba diving. When Jerry retired from Ball Aerospace in 1994, there was no slowing down. RV trips through Canada, throughout the southwest and into Mexico, and California, diving adventures in Hawaii and the Carribean, camping and fishing trips around Colorado, and just getting together with friends were ongoing until Helmi passed away in 2008. Jerry often said that taking care of his little puppy, Schnapps, kept him alive through his grief. Then in 2009, he met Jean Cutshall in Cardiac Rehab, fell in love, and they became partners in 2010. Another wonderful adventure continued for 9 years with golf, travel, fishing and lots of good times with their families and friends new and old. And now he has left us to remember how grateful he was for such a full and wonderful life! Jerry is survived by his son, Scott Brown and his wife Pam, grandsons Michael and Jason, his partner, Jean Cutshall, and her son, Joe Cutshall, daughter-in-law, Caroline and granddaughter, Sophie, all from Colorado. He is also survived by sisters Harriet Servais, and Ruby Wouters; nieces Robyn Servais and Pam Wussow, nephew Gary Servais, and niece-in-law, Jean Servais, all in Wisconsin. 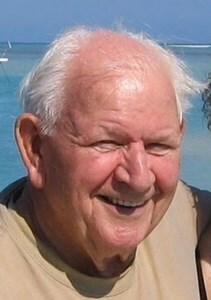 He was beloved by many more great and great-great nieces and nephews, friends and neighbors, and wonderful caregivers. He will always be remembered for his delight in life, his generosity and his positive, optimistic outlook on life. A Celebration of Jerry’s life will be held on December 27, 2018 at 1:00 p.m. at Two Penguins. Please bring your memories to share. Please RSVP to Jean Cutshall if you plan to attend Jerry's celebration. In lieu of flowers, donations may be made to University of Colorado Hospital Cardiac Rehab Fund or to The Wild Animal Sanctuary in Keensburg, Colorado, or to the charity of your choice. a. Please have individual fill in, “in Memory of Gerald Philip Brown”. 2. If donating by check, please note on check that the donation is to go to Cardiac Rehab Fund. To share a memory of Jerry or leave a special condolence message for his family, please click the Share Memories button above. Add your memories to the guest book of Gerald Brown. Will always remember Jerry with a big smile on his face and requesting "sh*t kicking" music to listen to while he exercised. What a great guy. He will be greatly missed. Sending love from Wisconsin. GO PACK GO! I will always cherish our Thursday lunches with Jean and Jerry, we shared many laughs and memories. Jean you have been in my thoughts and prayers. I’d heard so many good things about him from the family and always enjoyed seeing him in pictures of family events. I will never forget the day we met and the two of us saying the same thing at the same time….”Ah, so you’re Marcia”, “Ah”, so you’re Jerry,“ which turned out to be a great overture to a wonderful and absolutely unforgettable week in Jerry's company. That very short time (less than a week) will remain with me forever as one of the most delightful times of my life! Jerry was so upbeat, so delightful, so positive, so jovial, so optimistic, and so very gallant and uplifting. He actually swept me off my feet ....every day, seeing to it that I got shoved up into the back seat of the van unharmed. Sending my sincere sympathies to Jean, Scott, Pam, Joe, Caroline and Jerry’s grandchildren Michael, Jason and Sophie. The first time I met Jerry was at his Mother’s house in Green Bay. I was dating Dennis his nephew at the time and Dennis told me his favorite Uncle was in town. So off to Grandma Brown’s house Den and I went. Jerry shook my hand, hugged me and offered me a beer. Not an ordinary beer but a warm beer off of the cupboard. It is not a custom in Wisconsin to drink warm beer, but I guess they drink warm beer in Germany. So, I accepted it with a smile! Dennis and I married and I got to know Jerry very well. Jerry and Dennis exchanged some rather humorous Christmas gifts and birthday cards over the years. Dennis and I had the pleasure to visit Jerry twice in Colorado and both times Jerry was on a mission to show us some fantastic sites. Jean and Jerry also had us as guests in their home, where Jean put on a feast….only the way Jean can and Dennis and I met her entire family, along with Scott and Pam and their two boys. It was a pleasure Jerry, you always made it fun. I will miss you and your happy ways. on the same team, Helmi, Bob and me. Lots of get togethers playing pinochle and puzzles, camping and having dinners togethers. I am so sorry to hear about your loss. As you remember your loved one today may you find some comfort in God's promise to put an end to death forever and reunite us with our loved ones. Revelation 21:3,4 and Isaiah 41:10,13 have brought me much comfort and strength. May they do the same for you.